This sprightly dancing figure is adapted from a form of Japanese paper relief art called "kurumie" - hence the title. She is dressed in a traditional Japanese kimono but wears an unusual hat that is executed in a padded suede applique with couched twisted cords in the grooves; the fancy ties have tassel ends. The figure carries a lavender Wisteria branch that is shaded with stem outlines, blackwork flower clusters and padded satin leaves. The face and hands of the figure are executed with white facile appliqués. The hair is stitched in a Web stitch variation, using a Kreinik black metallic braid for the laid rows and black silk for the top stitches. The remaining areas of the costume are a combination of solid textured patterns and diaper patterns. The kimono itself is embellished with a variety of composite patterns. An elegant border with a blackwork framework surrounds the graceful figure and incorporates many of same soft colors and threads used in the costume. These include a variety of silks, pearl cotton and floss, four different Kreinik braided metallics, Coronet gold metallic, Bijoux fine metallic, Very Velvet and a background pattern done in luxurious Burmilana. 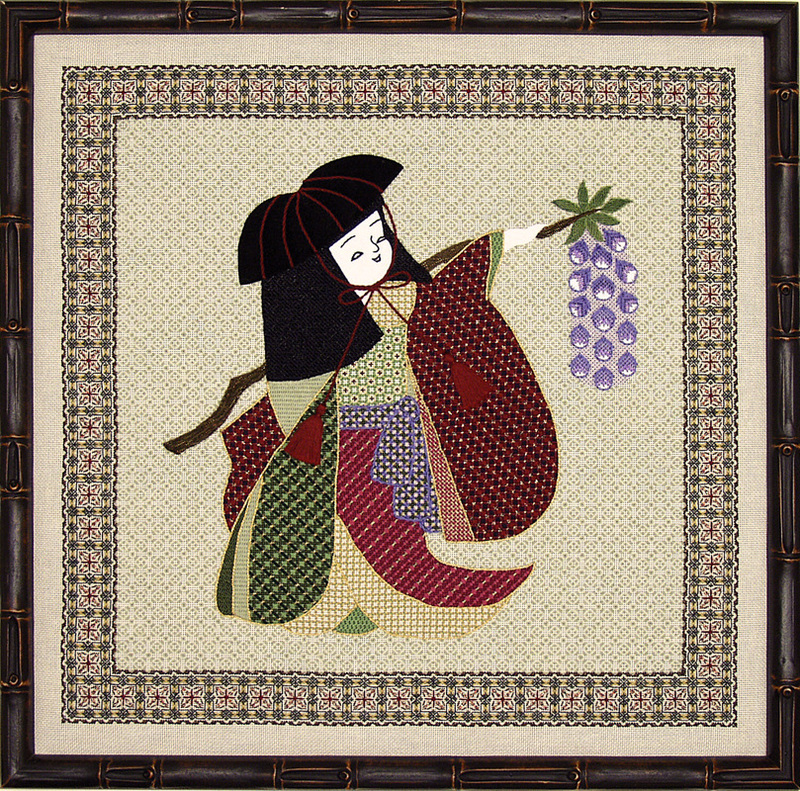 COLOR CHOICE: The color scheme for this class was inspired by an Oriental fabric. The first class that executes this design did not have a color choice, but one of my pilot students stitched the design in mandarin reds with the same bronze and black areas. Ecru and coral threads were substituted for the purple and green accents in the original model. This interpretation is being offered now as an alternative color choice. PREWORK: The border outlines of one quadrant must be stitched. Estimated time: 4-6 hours. 2. To share my methods of choosing compatible stitches and colors for borders to control the scale and balance within the design. A border should unify a design rather than compete with it. 3. To share ideas for developing original patterning in general - emphasis here on composite patterns that combine two or more stitches or stitch treatments. 4. To share ideas for interpreting figures in general and for stitching garments - shifting patterns in separate folds to add realism to the skirts, shading, face treatments, counted vs. free form figures etc. Examples of other figures will be shared in class. TEACHER PROVIDES: A detailed instruction booklet, a color photograph, a mounted canvas, and all threads and materials needed to execute the design. STUDENT PROVIDES: 2 HiLiter pens, a laying tool, 12" ruler, embroidery scissors, clamp or weight to secure frame to the working table, lamp and/or magnifier, if needed, along with an extension cord. TEACHER'S CLASSROOM NEEDS: Blackboard, eraser, and chalk preferred (marker board is an acceptable alternative). U-shape arrangement for student tables preferred. Need large table somewhere for exhibit of visual aids. Small table in front near board for teacher's notebook and stitched model. NOTE: This class was originally proposed as a two-day class. The first group (as well as many of my pilot students) felt it would have made an even better four-day class so I am now offering the class both ways. Most chapters are unable to have a four-day workshop in back-to-back days but for a seminar setting this would be ideal.